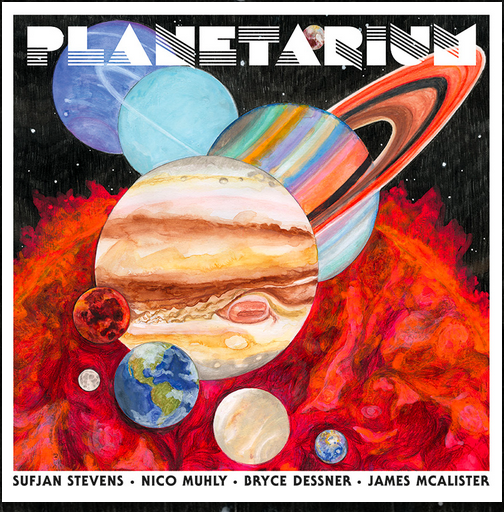 planetarium | sufjan stevens, bryce dessner, nico muhly, james mcAlister - The Earology Dept. | The Earology Dept. i’ve read many over analyzed reviews concerning the album Planetarium by the super group consisting of Sufijan Stevens, Bryce Dessner, Nico Muhly, and James McAlister, that is nigh impossible to get an idea of whether I am reading reviews penned by living and breathing humans or unfeeling bots. when approaching new music my methhod is this, mostly ignore other reviews at all costs. reading to what somebody else has to say can often muddy the waters. so i just listen to the music, beleaguered or unfettered within my own limited experiences and perspectives. and by doing things this way is assertively and fundamentally okay with me. although, i must add sonic missteps do occur so there’s that. but isn’t the possibility of disappointment part and parcel to the discovery of new music? the risk of the music not meeting your expectations happens. that’s just life. generally speaking though unless your going out on a limb and dropping the needle on a band or artist’s music you haven’t enjoyed before it is pretty much a safe bet you will like their new material, but they’re exceptions. but if i don’t like something it isn’t wrong to critque it. i just do it tastefully minus the robost disdain. hence, you won’t read negative reviews by me on my blog. not that you’ll like everything here, but you just might. why is it i without negative reviews? well, because if i don’t like the music what’s the point of spreading negetivity? hell, i didn’t like john coltranes’ ‘a love surpreme’ upon first listen. so what do i know? in a nut shell, i like what i like and that’s the way it is. however, with the release of Planetarium, which i picked up at a local record store, i was both lucky and appreciatve. while combing through the stacks i chanced upon this would be jewel and remembered i had been looking for it but had forgotten my curiosity interest about it until now. serendip. but even after my purchase it was a full week before i dropped the needle on it. but drop the needle i did. in store, i queried the staff, “have you guys listened to this? “Nada,”was their unified response. i stood there with the album in my hands admiring the artwork on the front and back. reading the names at the bottom of the album of which only two i immediately knew, solo artist Sufijan Stevens and Bryce Dessner of band The National. my reasoning, knowing two of the four artists gave me a 50% chance of striking gold. and further, would Sufijan and Dessner make an album with bums? i think not. so, stood there in the record store and i made the decision to go for it. And neither did i want to look up reviews online. and here’s the thing, i would rather ask a store clerk about an album as opposed to reading an oftentime highbrow ream about how bereft of substance a body of music is based on some schooled critic’s over static filter of which i cannot (nor want to) identify with. i am just coming for the music and how the music initially makes me feel. i just want what the artist has done to be agreeable and to create a medium for further comtemplation and self-analysis. if the music makes me feel something good, then it has upheld it’s end of the conversational bargain and there is hope that this dialogue will evolve and continue. that it will reveal facets and a range of temperatures both cold and hot. Plantarium meets this criteria and for me that is all that matters. i like this album and think you will too. what an absolutely beautiful body of work. the songs work upon the theme rather than towards it, or rather within it, majestically bespoke. evoking awe and humility and so many other congenial and emotive reckonings. i am at peace with the music because the music has allowed me to be at peace with myself. i listen through the unrefined ear of my own dilettante experience and i am copacetic with that. peace. the album Planetarium is out now courtesy of 4AD Records.